TCAT are delighted to welcome back The Festival Players Theatre Company, a professional theatre company delivering the best in open-air Shakespeare, committed to presenting the very best in touring theatre. The company continues to grow in reputation internationally. Much Ado About Nothing is one of Shakespeare’s greatest comedies – a tale of love, deceptions and misunderstandings. “The course of true love never did run smooth”, but the sparring antics of Shakespeare’s erstwhile lovers, Beatrice and Benedick, provide great hilarity for the other members of the household who plot to reunite them. Against this background, another romance is almost derailed by the machinations of a jealous Duke until the local constabulary bumble upon his plans. Don’t miss this Summer treat – enjoy Shakespeare as it should be experienced – in the open air! 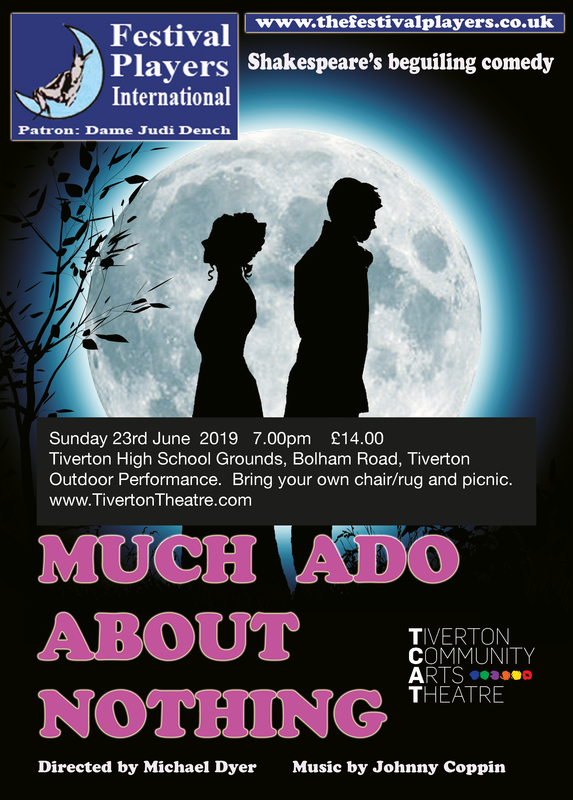 This is an outdoor performance (indoor performance if poor weather) in the grounds of Tiverton Community Arts Theatre. Please bring your own chairs, cushions, rugs and make yourself comfortable. Picnics welcome. Refreshments, including bar on site.